Greece’s conservative party New Democracy leader Vangelis Meimarakis has admitted defeat to Alexis Tsipras’s left-wing Syriza party in the nation’s fifth election in six years. He conceded to Syriza as the lead of 35 percent was announced by the interior minister. New Democracy is trailing at 28 percent with a third of the votes counted. This is likely to leave Syriza just short of an absolute majority, and the party would need partners. To discuss all of this I’m joined by Aris George-Baldur Spourdalakis. He’s a member of the Syriza Youth party since 2007. He’s a graduate student in physics at the University of Toronto. I’m also joined by Leo Panitch. He’s a Canada Research Chair in comparative political economy and a Distinguished Research Professor in political science at York University in Toronto. He’s the author of the UK Deutscher Book Prize winner, The Making of Global Capitalism: The Political Economy of American Empire. Gentlemen, thank you for joining me. ARIS GEORGE-BALDUR SPORDALAKIS: Hi. Thank you. PERIES: Aris, let me start with you. What are the results that are unfolding that’s deeper than what I said just now in the intro? SPOURDALAKIS: Well, I think that the results are a triumph for Syriza. Mainly Alexis Tsipras. It’s a vote of confidence towards the previous government of seven months. And I think that it shows that the signing of the agreement, despite the negative effect that it may have and continue to have, hasn’t affected Syriza’s electoral poll in the last [months]. PERIES: And Leo, you’ve been watching the results unfolding. Your particular take in all of this? PANITCH: Well I should tell your viewers, Sharmini, that I’m here with Aris because he and his wife have continued a family tradition of close friends and family around to watch election returns. Which, given how many elections there are in Greece, means that there’s a lot of family dinners of this kind. We’ve had food and drink with friends and have been watching the returns. And I must say, a pretty large abstention is indicative of the number of people who voted in the referendum where the turnout was very high, over 70 percent, who have been disillusioned. And that’s very significant. That said, those who did vote, it is remarkable how many of them have voted for Syriza and how few of them have voted for Popular Unity, LE. Broke away from Syriza in calling what they had done capitulation rather than blackmail, which is what it really was, of course. PERIES: Here you’re talking about the split off of the Left Platform of Syriza, now called the Popular Unity party, which at this moment has not garnered enough votes to actually make it into parliament. Which leaves Syriza without that critical voice in parliament. PANITCH: Much more than that, I think it means that the position, which I think is an important one, that it’s necessary to break with the eurozone and if possible break the eurozone, will no longer be articulated in the Greek parliament. And [if it isn’t articulated] in the Greek parliament it won’t be in the Greek media. Had they stayed in the party I think it would have been much more visible and that important debate could have continued, probing how far one could stay within the, break with the current arrangement. PERIES: Aris, one of the things that has happened now is that with the Left Platform and Popular Unity somewhat out of the way, this has given way to some additional members in parliament for the third party that at this time looks like it’s going to be Golden Dawn party, and they have appeared to have garnered a few more seats. How do you think that will transpire in the parliament? SPOURDALAKIS: Well, I think that the reason that Golden Dawn has gained a few more seats is that the political system has been [inaud.] by the recent events. Syriza was forced into signing an agreement which was contrary to their program. Therefore this does help voices which are inherently against the democratic process and so on. However, I think that the result does give Syriza at least a chance to prove that signing of the agreement doesn’t mean the end of the program and the end of what they can do. 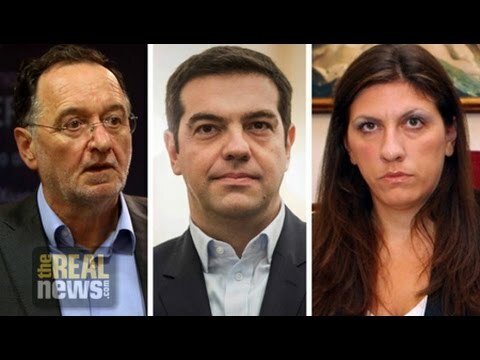 And the fact that they will be able to form a government with their former partners, the Independent Greek party, will at least give them this chance to try to prove themselves and prove the agreement is not the beginning and end of Greek politics right now. PERIES: Aris, you’re a member of the youth wing of Syriza. And this voter turnout being just about 55 percent is a clear message of the disillusionment of the youth itself. And I understand that there was much less mobilization and enthusiasm in this election. How are you receiving this, and how do you think the Syriza Youth will be moving forward? SPOURDALAKIS: Well, first of all I would say that it’s–I’m a member of what’s left of the Syriza Youth. The majority of the Syriza Youth left the party after the decision of the government to call the election before the party congress, which was programmed to be held in September. So I think that, I think that despite the fact that Syriza won the election it’s clear that a lot of their members have been disillusioned. And I think there are two main points to this. The first point, which refers to the fact that the Popular Unity party of the Left Platform of Syriza wasn’t able to attract these voters. And this shows I think that the main problem and the main reason that this has happened was not the agreement, per se, but it had to do with the democratic process both within the party and outside of the party. The first point. And I think the second point has to do with how much the elections affect people’s everyday lives. And I think that right now what is viewed, the agreement is what will affect what is viewed as, what is going to affect people’s everyday lives in the future. And if that is not–if that changed as a view I think that we’re going to see more and more people being disillusioned and abstaining from the popular vote, or even turning to more [radical] solutions, either to the left or to the right. PERIES: And Leo, what does this result mean in terms of the formation in parliament? How is Syriza going to lead, with what kind of a coalition? PANITCH: Well, I don’t think it changes anything. Syriza will be effectively the government. It’s clear that they were reelected along with ANEL, but it’s a Syriza government effectively. I think that the–and I must say in terms of the vote, if you look at the breakdown of the youngest category of voters, they overwhelmingly voted for Syriza. Overwhelmingly so. According to the exit polls and the questions [asked]. That’s significant, I think. In terms of what goes on inside Syriza now and inside the Syriza government, I think it’s a very good question. It’s very much my hope that having secured this vote that Syriza will now probe the openings within the framework of this memorandum that was forced on them, insofar as they stay within Europe and the eurozone. But to prove the room for maneuver they have. And I think with the mandate they’ve received they have every right to. [Inaud.] with, given the wording of the memorandum, one of the key red lines of Syriza was to reintroduce basic labor rights in Greece which the previous memorandum had taken away. And the legislation under it had taken away. It’s very important, I think, that they go ahead with collective bargaining legislation and restoring the rights to [work]. I don’t see why that’s not possible. I think the Europeans would have to allow them to do it. Because what they’re attempting to do is [establish] what basic rights are in Northern Europe. Not even as much as that. So I think there’s room. That’s not to say that they don’t need to figure out, as I hope they will, to break with the logic of the eurozone and neoliberal Europe. But I do think they have the basis now to begin probing and pushing–after all, they’re the government. And these accountants, these accountants, these imperial accounts they institutions sent in may be sitting there, but they are not the government. And I think it’s very important for [us] outside and for Syriza itself to bear that in mind. PERIES: And Leo, what does this mean in terms of the coalition they will still need in order to govern? PANITCH: Well, this doesn’t [improve] the difficulty whatsoever. You could see [inaud.] leader spoke just now on television that he considered this totally in an alliance with Syriza. Thought that he did very [inaud.] and now we’ll have a couple of ministries. But that’s not significant at all. In fact, the most progressive legislation that the government was able to pass they were able to pass with ANEL. The humanitarian legislation which was introduced for the poorest immediately in February, without getting the approval, by the way, of imperial accountants of the Troika who were demanding that they be shown the legislation. And then the granting of citizenship rights to the children of immigrants, which was passed in March. And you have here a nationalist party that they’ve aligned with. They weren’t able to block that. So no, I don’t think that in substantive progressive, even socialist terms, this really is very much of a drag. PERIES: And what about the left wing of–well, what does this do to the left, period? PANITCH: Well, [outside] Syriza there remains people who are on the left. Including in the cabinet there will be. Not least the finance minister, [inaud. ], and he will be pushing no doubt for a strategy that would allow them, in all kinds of arenas, to be doing progressive [inaud.] health and education, et cetera. And I hope to be probing even within the area of finance as much as possible to put through a number of substantive progressive policies. PERIES: And Aris, it appears that if Antarsya and the Popular Unity party had formed a coalition or at least a united party that they would have stood a better chance at entering the parliament. What do you make of that? SPOURDALAKIS: Well, I think in sort of, in a sense that may be true. However, I think that this also shows sort of the problem that the, the left [in general] has to unite for a common goal. And also I think what it shows is that the [spark] that both Popular Unity and Antarsya were vocalizing in favor of protecting the Oxhi vote, the No vote, of the referendum of the 5th of July, which won 62 percent of the popular vote. They were not able at all to capitalize on this. I think there are many factors, of course, that play an important role in this. But I think the main problem, I think, was that they were not able to convince the people that they had a plan, which is the first–which is the most important. And also I think that the anti-Syriza [rhetoric] ran too harsh and was unfairly harsh. And I think this put a lot of people off in voting for more radical [anti-EU] solutions. PERIES: Aris Spourdalakis and Leo Panitch, thank you so much for joining me today. SPOURDALAKIS: Thank you very much. Aris George-Baldur Spourdalakis has been a member of SYRIZA Youth since 2007. He attends the University of Athens, where he is a student of physics and an activist.